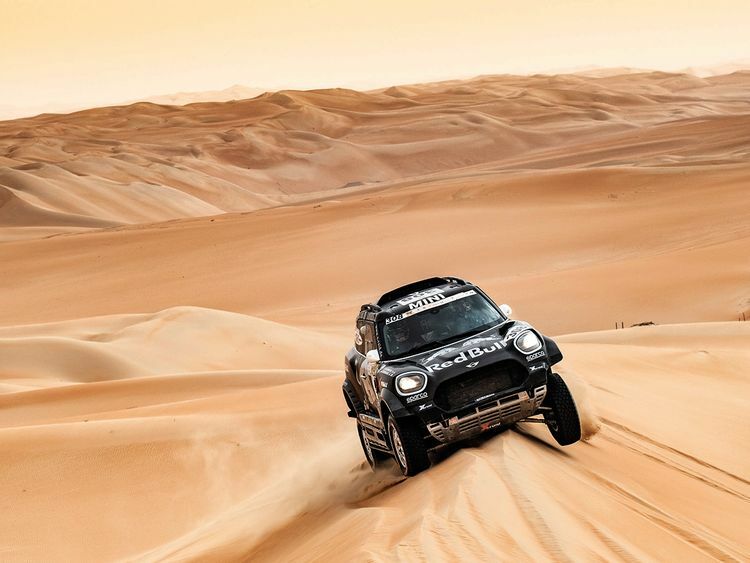 Abu Dhabi: Stephane Peterhansel and Sam Sunderland remain the men to catch after a day of drama in the Abu Dhabi Desert Challenge set the scene for a thrilling last-leg sweeping back to the UAE capital. While Peterhansel extended his overnight cars lead to 18 minutes and 35 seconds from the UAE’s Khalid Al Qasimi, the trail of misfortunes which stopped some of his main rivals in their tracks on the 286.10km Adnoc stage suggest that victory is anything but certain. Al Qasimi in the Abu Dhabi Racing Peugeot 3008 DKR was one of several drivers to be stopped by soft sand early on. He recovered and will find confidence in the fact that he started the final leg with a far greater deficit two years ago and went on to win. Finishing the day in third overall another 27:37 adrift was Poland’s Aaron Domzala in a Toyota Hilux Overdrive. Completing the top six were Russia’s two-times winner Vladimir Vasilyev in a BMW X3 followed by the two CAN AM Maverick X3 buggies of Brazil’s Reinaldo Varela and American Casey Currie who are separated by just 43 seconds. Sunderland’s bikes lead, meanwhile, was whittled down to a slender 18 seconds by Chile’s Jose Cornejo, Wednesday’s impressive stage winner. The reward in cross country rallying for winning a stage is being first away the next day, with no tracks to follow and the pack giving chase, and not for the first time overnight leader Sunderland felt the heat on Thursday. His was only the seventh fastest time, 12:33 slower than Cornejo who is now breathing down his neck, with the battle for the title looking very much like a two-bikes race to the finish, barring any final leg disasters for the leading pair. “We have seen again today how tough and unpredictable the Desert Challenge can be, and we look forward to a great finish tomorrow, knowing there could still be more surprises,” said Mohammad Bin Sulayem, President of the Automobile and Touring Club of the UAE, the rally organisers, and FIA Vice-President for Sport. The rally finishes at Yas Marina Circuit at 5pm tomorrow.